A Tudor Weekend Away…in London – the Christmas Edition in Coming! Would you like a Tudor Weekend Away…in London? Would you love to combine your passion for Tudor history with a heart-warming dusting of Christmas sparkle? It’s getting really chilly here in the UK; some places have had their first snow fall; the jumpers and boots are out of the closet, and the shops are filling with the buzz of busy shoppers, as everywhere begins to gear up to the festive season. Christmas can be a magical time of year, full of family, sparkle and festive carols – but what if you could combine the very best of winter with your love of the Tudors? Here at The Tudor Travel Guide we have the perfect solution: ‘A Tudor Weekend Away…in London‘, the Christmas Edition, launches very soon. Read on for more details on how you can have your best Tudor Christmas ever! Although summer is traditionally the time of year for travel and visiting historic properties, winter can be magical in its own special way. Imagine your favourite Tudor house dressed for Christmas; Christmas trees decorating great halls, glitter and sparkle everywhere. The great news is that for Tudor time travellers like you and I, there are lots of Christmas-themed events, re-enactments, and Christmas fairs to be enjoyed – and Hampton Court Palace even has its own ice rink! Are you looking for family entertainment for the day, or are you heading out for your own special, Tudor, Christmas experience? Maybe you are looking to arrange an entire weekend away to enjoy some of the very best historic sites – and serve it all up with a big dollop of Christmas on the side! Well, ladies and gentlemen, let The Tudor Travel Guide be your Christmas fairy! “A Tudor Weekend Away…in London – What’s Inside? The new Christmas edition of ‘A Tudor Weekend Away‘ focuses on three properties with fascinating Tudor connections. This time we will be time travelling together to historic London, and will be diving deep into the Tudor history of Hampton Court Palace, Charterhouse Square and the Church of St Bartholomew the Great. Hampton Court hardly needs introduction; it is the most magnificent and historic of Tudor sites – and certainly a firm favourite with many Tudor time travellers. In the mini-guide, we go together in search of the public and private apartments of King Henry VIII, seeking out all the hidden nooks and crannies, lost doorways and ‘must see’ features. 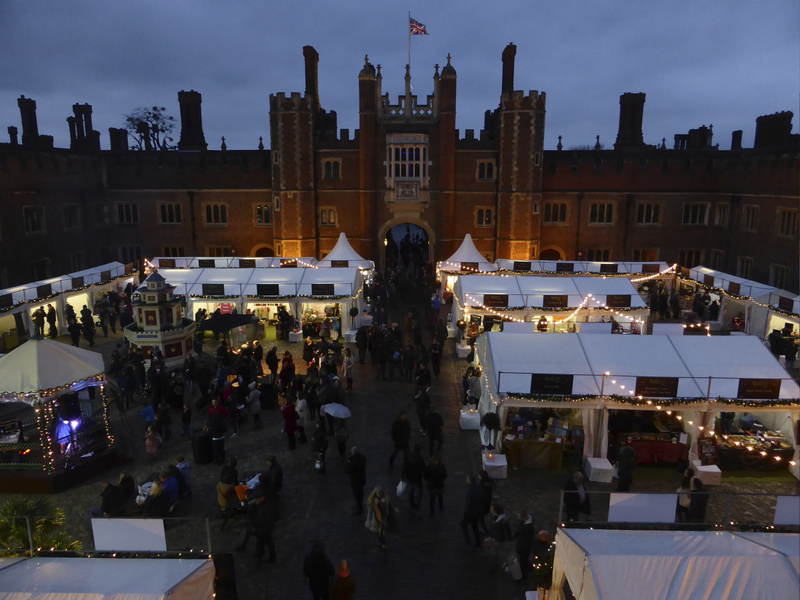 The family will enjoy the festive spirit of Hampton Court’s very own Christmas Fair; its twinkling lights, and the treats to be had, all evoke the spirit of Christmas; or perhaps you could try your hand at gliding around the ice rink as you soak in the view of Wolsey’s original gatehouse? For our second and third locations, we head over to the City and combine two places which are within just a few minutes walk of one another; Charterhouse Square and the Church of St Bartholomew the Great. Both are delightful, hidden gems, well off the tourist trail. We lift the veil on the obscure Tudor history associated with Charterhouse Square, where you will also meet some of its famous sixteenth century residents, all well-known names of the Tudor court. Learn also about the largest Carthusian monastery in England – prior to its Dissolution – and the traitor held captive there as a result of his involvement in a plot to assassinate Elizabeth I. From there, we take a short walk to St Bartholomew the Great, THE most beautiful church in London. It is one that is often missed, even by locals, as it is so tucked away. The church has some interesting Tudor architecture and history associated with it, and was once the home to a man whose hands were steeped in the blood of Anne Boleyn, -because his involvement with her downfall. The church has exceptionally fine, early medieval architecture and a visit there will enfold you in a glorious Yuletide warmth, when you time your visit to coincide with one of its many Christmas services. So whether you are wanting to enjoy your Tudor fix – and get in the festive spirit – from the comfort of your own armchair, or you want to use this guide to plan your next Tudor adventure, either this year or next, A Tudor Weekend Away…in London is a perfect Christmas present for either yourself or your Tudor-phile partner. The full colour mini-guide will be on sale soon for $8.00 (£5.98) . However, preorder will be available for a VERY limited period of 5 days. You will be able to get your copy at a full 50% discount off the list price during this limited period. Thanks Annina, I always appreciate your ‘likes’ and so glad you have said ‘hello’! That’s lovely feedback to hear. Thank you.